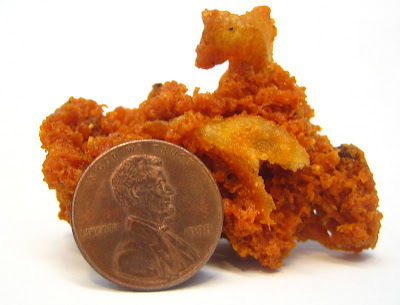 A crunchie is a collection of congealed, random deep fryer particles that gather together over several rounds of fast food fries, fish bits, nuggets or cheese sticks and somehow gain buoyancy and are set free once they are big enough to get stuck in the small metal openings of the wire basket. This crunchie managed to make it past Quality Control person #13 at the local Arby's. The penny is not there to help you determine the size of the crunchie, but rather to make you think about which would be healthier to swallow. Anyone got any photographic evidence of a larger crunchie or should I send this photo off to Guinness World Records? I worked at Arby's for 3 years in my teenage years. We used to call those "golden nuggets". They usually came out of the curly fry bag that way. Best guilty pleasure EVER. Pop 'em in your mouth for a flavor explosion! It's no wonder I had my first heart attack at age 31. I find the best of these come from a faux seafood place like Captain D's or Long John Silvers. These places have the most variety of fried foods and thus the greatest potential for fryer aggregation. I agree 100% Thomas. I assume the batter bits are put there on purpose. Check and see if the guy that commented above you ever worked at a LJS.